Panthers team chief Carl Johnson insists a winning start to the SGB Championship season is a must. The city side entertain Scunthorpe tomorrow night (Friday) at the East of England Showground (7.30pm) in the first competitive meeting of 2017 at second-tier level. And it provides an early opportunity for Johnson’s men to begin the process of making the Alwalton track a fortress all over again. Panthers’ home form has let them down in the past two seasons. They lost seven times on their own shale last term after slipping up on six occasions in 2015. “We need to start well and that means picking up a win in our first meeting,” said Johnson. “I’m expecting a tough night though against a Scunthorpe side who have managed to keep together the same team that finished last season well. “We all know our home form has been nowhere near good enough in the last couple of years and that’s something which needs to be put right. “We need to make the Showground a place that opposition riders don’t look forward to racing at. “Getting results on our track is going to be key in making the play-offs and being title contenders. We feel we have put together a team that is good enough to get us there. 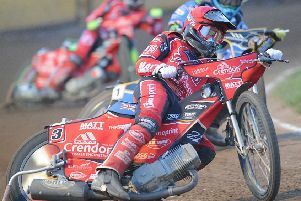 Johnson revealed the East of England Showground surface is likely to be much grippier tomorrow night than for the curtain-raising Challenge clash against Coventry last Sunday. Dry and windy conditions left the surface looking particularly slick with race times regularly as more than five seconds slower than standard. Johnson added: “The track needs time to bed in after undergoing some extensive work in the winter, and we received plenty of compliments from both teams about how smooth it is now. Scunthorpe are a team built similarly to Panthers with strength-in-depth the favoured approach. Their side features Lewis Kerr, who impressed for Coventry last weekend, and popular former Peterborough man Michael Palm Toft. PETERBOROUGH (expected riding order): 1 Jack Holder, 2 Simon Lambert, 3 Paul Starke, 4 Ulrich Ostergaard, 5 Kenneth Hansen, 6 Bradley Wilson-Dean, 7 Tom Bacon. SCUNTHORPE (expected riding order): 1 Ryan Douglas, 2 Carl Wilkinson, 3 Lewis Kerr, 4 Michael Palm Toft, 5 Josh Auty, 6 Fritz Wallner, 7 Josh Bailey.